Recent incidents in the UK and the alleged chemical attacks in Syria by the Bashar al-Assad regime have brought the subject of chemical weapons back into the public domain. To date these types of event have been relatively rare because terrorist plans to harm large numbers of people have mostly been thwarted. This is the first part of a two-part article on nerve agents. Part one gives an overview of these agents, their historical background and manufacture, and how the agents affect physiology. 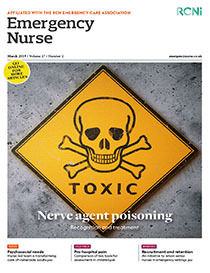 Part two, which will appear in the next issue, considers the pre-hospital response to the use of nerve agents, including effective triage and decontamination, and in-hospital treatment.